New tires, Comments: Fully equipped with all the extras. 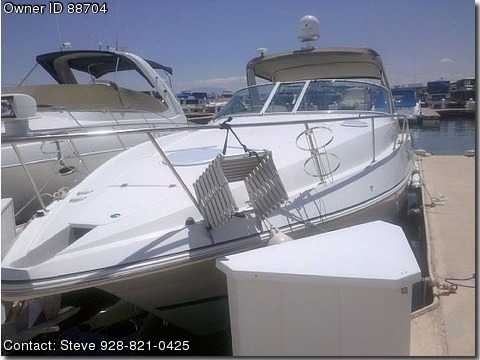 16000 BTU air/heat, aft cabin, Clarion CMD/4 Satellite ready, amp/ sub woofer, cockpit speakers, KVH M3 entertainment system, Bimini top, carpet, cherry door w/trim and beige interior Coast Guard pack, compass, depthfinder, Garmin 178CI GPS, dockside power, enclosed Flybridge w/custom screens for winter/ summer new 2008, full gauges, offset galley area, central vac system, 2 refrigerators/ freezer, stove, Kohler 7.3k Generator w/ sound shield, Halon, vacuflush head with separate walk in shower, 3 batteries, VHF, Windless w/ anchor and extra chain, westbar stowaway ladder on port side , Documented, Prof. maintained, central vac, SS prop, storage, swim platform w/ extended ladder, trim tabs, 4 Axle trailer, TV/VCR Direct TV ready, hot & cold water, sleeps 7, antifouling bottom. Stored inside during the winter.